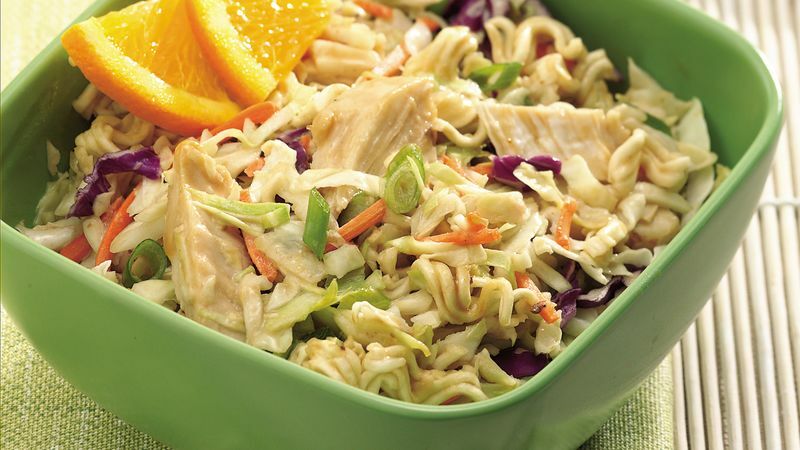 In large bowl, combine coleslaw blend, onions, chicken and salad dressing. Discard seasoning packet from soup mix; coarsely crush noodles. Add noodles to salad; stir gently to mix. Serve immediately. This salad can also be made with a two-color slaw mix. It won't be as colorful, but will still taste great. You can use chow mein noodles in place of the ramen noodles. Crush the ramen noodles and slice the green onion ahead of time. Place them in separate sealed containers. Just before serving, mix with the remaining salad ingredients. This salad does not hold well once the salad dressing has been added.